In order to demonstrate, I am using a sample table, i.e. Person. Person of AdventureWorks database which has more than 15K Records. Create a new Empty ASP.NET MVC Project and add the below Models in the project. 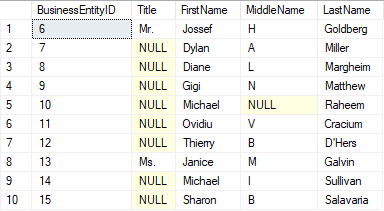 In above code, We have Person Class which is used for the binding the Person Table Data. Pager class for the pagination which have parameterized constructor and accepts totalitems i.e. Total Records, page for CurrentPage and pagesize as parameters. We have created PersonViewModel as we need multiple models in the view. Add a controller in your project and add the below code in the controller. I am connecting to the database using ADO.NET directly in the controller just for the demonstration purpose (not recommends in the real-world project). You can make changes as per your need or project you are working with. In the below code, we have set the PageSize to 10 which stands for the number of rows or records to be shown on per page, then we connected to the database and call the procedure by passing two parameters (OffsetValue and PagingSize) required by the procedure. In the above procedure, we are using OFFSET and FETCH NEXT clause which is used in conjunction with SELECT and ORDER BY clause. Value of Offset must be equal and greater than Zero. 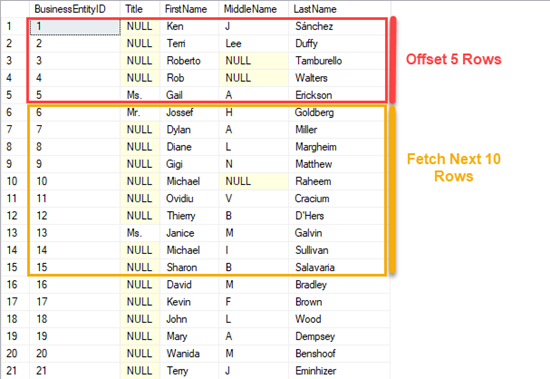 Offset stands for the number of rows to be skipped and fetch will pick the number of rows to be picked after offsetting the number of rows. Run the below query on the AdventureWorks database. After running the above query, you will get the below output. Now let’s add the below code on the view. We are using bootstrap for the UI Designing purpose. You can add the bootstrap in your project from the NuGet package manager. When a user clicks on the paging, it will call the get request to the Index Action method and picks the next records to be shown accordingly. Now, Build and Run the application.